Heat the oven to 350 degrees F. Line baking sheets with parchment paper or Silpat type liners. In a stand mixer fitted with the paddle attachment, beat the butter and sugar (1/4 cup) on high speed until light and fluffy, about 3 minutes. Beat in the vanilla. With the machine running on low speed, gradually add the flour until incorporated. Beat in the Nutella. 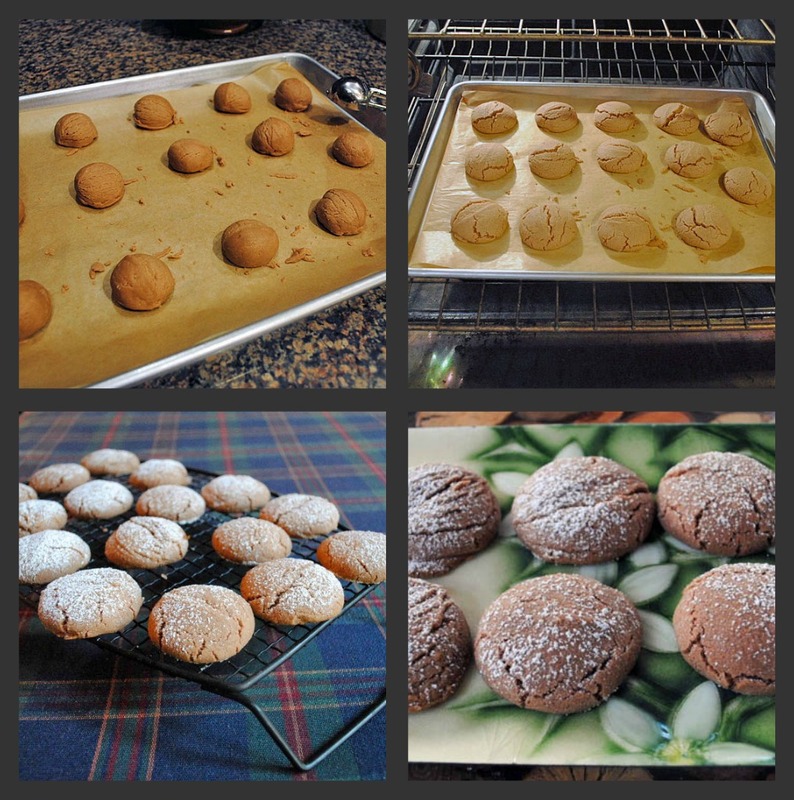 Using a small cookie scoop or a tablespoon, drop small balls of dough onto each baking sheet. Bake until the bottoms of the cookies flatten out slightly, 10 to 12 minutes. Cool for 5 minutes and transfer to a wire rack to cool completely. If you want to sugar-coat the cookies, place 1 cup of powdered sugar in a medium bowl, and roll the cookies in the sugar until coated. Alternatively, you can add the sugar to a sieve and sprinkle some on the surface of the cookies once they are cool. Store in an airtight container at room temperature. If you read the many reviews of this recipe in the FoodTV website, you’ll notice not everyone fell in love with it. I suspect it’s all related to how long you bake these cookies: under-baking is the key, or they’ll be too hard and dry. I liked the simplicity of the recipe, very few ingredients, quick to put together and bake. But the best is that it gave me the chance to use for the first time my brand new cookie dough dispenser – loved it! I grew up on nutella too 🙂 what a simple and approachable cookie: thanks for baking! I bought a jar a month or so ago and meant to find a recipe or two, I did and promptly forgot about them and now I have to try these cookies! Thanks for the reminder Sally. Under-baking cookies is totally the key for me! I like them crispy on the outside but completely soft on the inside. Yum!!! While I’m not a huge nutella fan, the kids love it. 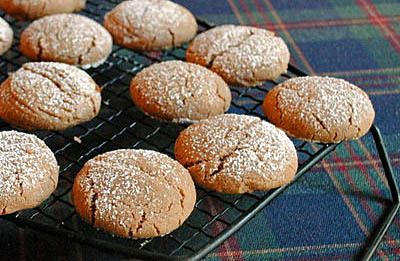 And these cookies look just like my mom’s spice cookies. 🙂 The story of your mom and nutella reminded my of my mom and sister. My sister was so super skinny as a kid. My mom would send her to school with fluffernutter and peanut butter sandwiches! Oh, Sally… these do look dangerously good!! – yikes… the problem with this stuff for me is it’s just so hard to stop…… it’s like trying to have one chip or French fry; I never quite manage it 🙂 But a mouthful of bliss, these are no doubt. Hope your weekend is going well. There is a new chip in town around here at least, NC sweet bbq and another tangy version…sucked me in, but I have great restraint. Head me to seagood and I’m done. I’ll be Scarlett and think about Nutella dessert tomorrow, the brownies probably since I will want to make the cookies and pannacotta. Thank you Sally for another great recipe. I made these cookies last night and they were a hit. Ah, a different cookie for Christmas! They sound delicious. Indeed… can you believe the festivities of the end of the year are only a couple of months away? Scary how fast 2011 is flying…. Ovens vary…but I baked mine for 12 minutes last night and today they are still soft in the center. This recipe will be part of my Xmas baking. I wonder how they freeze. Those look SO good! My hubby is allergic to nuts, so I’m thinking that I’ll have to make these for a girl’s night sometime soon. Ha, ha. what a sad allergy to have, don’t you think? Nuts are soooo good! The Filling. I was really worried about filling cookies. I mean, it seems like it shouldn’t work. It seems like the filling should just flow out and make a big mess all over the place. But that doesn’t happen. The cookie dough seals it in and completely conceals the hidden fruits. In a small bowl, combine the Nutella and powdered sugar and stir to combine. Then form 24 small balls of Nutella. They should be about Teaspoon sized. Just roll the balls quickly to make them roundish. They don’t have to be perfect obviously. Lay them out on a baking sheet lined with wax paper. Keep these on the small side. Making the Cookie dough. This cookie dough is pretty straightforward to make. Start by creaming your butter and sugar together just like any cookie dough recipe. Once the mixture is light and fluffy, mix in the egg and vanilla extract. Then in a separate bowl, melt the chocolate and milk together. You can either do this in the microwave (be careful not to burn it) or over a double boiler. Let chocolate mixture cool to room temperature and then add it to dough. Finally, mix in all the dry ingredients (flour, etc.) Try not to over-mix the dough. Once you have it all combined, scrape it out onto a sheet of wax paper. Making the Cookies. Roll the chocolate dough out to about 1/4 inch thick. When rolling it, it’ll be easier if you add a second sheet of wax paper on top of the dough. Then slice off about an inch-by-inch section of dough and stick a Nutella ball right in the center. Using your hands, form the chocolate dough around the Nutella ball. It shouldn’t be that hard to do. Then just roll the dough into a ball and dunk it into the chopped peanuts. Roll that around until the ball of dough is completely covered. Then store the ball of dough on a baking sheet lined with either a Silicon mat or parchment paper. You should be able to fit 12 cookies on a standard baking sheet. Once you have all the cookies formed, use a measuring cup to slightly smash each ball down until it’s flat. Baking the cookies. Bake these guys at 350 degrees for 8-10 minutes. They should be slightly soft when you take them out, but they’ll harden a bit as they cool. Let them cool before biting into one if you can help it. There should be a nice layer of Nutella right in the middle of each cookie! Cute cookies! I bet they are very addictive. The moment I have Nutella in my cupbord I’m going to make these. I’ve been needing an excuse to make Nutella in the Thermomix and I think this could be it. Oh I am so jealous Barbara you have a Thermomix 😉 – my girlfriend has one and she lets me use it. I’ve made corn soup and spaghetti sauce so far. The Thermomix is on my “wish list”. I’ve always been curious about it, wish I could use one just for fun, see what’s all about. It is amazing what you can do with the Thermomix….you can make great food in no time at all. Spaghetti sauce takes maybe 30 minutes. Sorbet takes 3 minutes. This gadget is used in restaurant kitchens. I loved the fact that my girlfriend got it first so I can test it….. I love cooking and experimenting new recipes or re-creating something that I ate at restaurant.